The easel canvas by Michelangelo, which is the only one preserved in fully finished form until today. This is a tdo, in which the artist depicted Mary, Joseph, Christ, and John. The painter creates the creation at a still young age. The picture vividly illustrates the master’s statement that complete painting can only be complete, which most closely resembles a monumental sculpture. The incredible twists of human bodies strike and impress at the same time. The figures are especially massive. Michelangelo uses a special technique in order to strengthen this feeling to the limit. The skin of the characters of the picture is incredibly smooth. It looks like gorgeous marble. 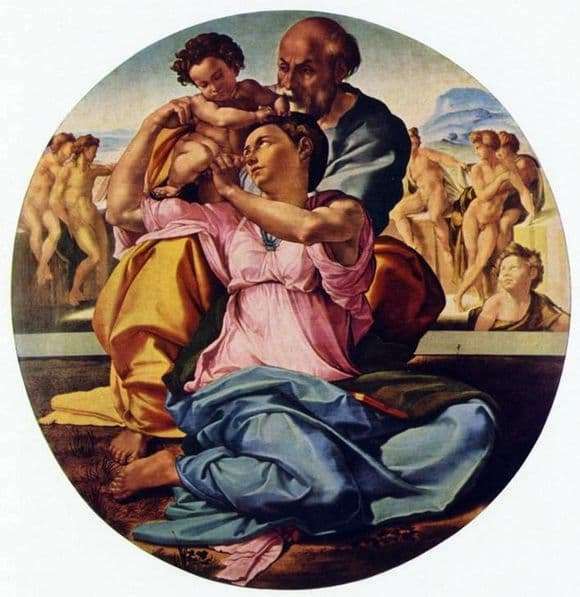 Michelangelo used very rich colors. Symbolism permeates the whole picture. It is complicated and it is not always possible to understand it correctly. For example, It is difficult to interpret the figures of men, which the artist depicted in the background. They are naked. Horizontal strip separates them from the family. Art critics try to interpret these figures in different ways. Some believe that these are pagans who are waiting for baptism. Others draw psychoanalytic parallels with the artist himself. The true meaning of this detail remains a mystery to us. The group in the center is similar to a composition created from sculptures. It is very compact. It creates the overall impression that it can be viewed bypassing it from all sides. We feel that Michelangelo thought like a true architect. All characters are clearly fixed in space, and the details are stable. But this creation is easel. The coloring is made up of flowers, surprising depth and freshness. Composition tondo closed. We feel the liveliness of the characters in this creation. Michelangelo was able to prove himself in this creation as an authentic master.